Key to Australian species of Olixon. Generated from Krogmann et al., 2009. Krogmann, L., Austin, A.D. & Naumann, I.D. 2009. 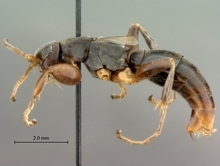 Systematics and biogeography of Australian rhopalosomatid wasps (Hymenoptera: Rhopalosomatidae) with a global synopsis of the enigmatic genus Olixon Cameron. Systematic Entomology 34: 222–251. Photographs included in the keys © Simon van Noort (Iziko Museums of South Africa) or © Volker Lohrmann (Museum für Naturkunde, Humboldt-Universität Berlin) or © Lars Krogmann (State Museum of Natural History, Stuttgart).